Today, the JW Marriott Los Angeles, we got an update on the state of the lodging industry from two of my favorite industry leaders: Mark Woodworth, President of Hospitality Research, and Mark Lomanno, President of Smith Travel Research. There is some good news, and some bad news, although both reports were optimistic on the direction we are heading. Here is my take on some highlights with some pertinent slides. Demand is back, but rate is not. The bottom line of the Smith Travel Research (STR) presentation is that demand is back, but average daily rate or ADR is not. And although increasing demand will eventually return pricing power to the industry, it has had very little effect so far. However, the preliminary data from June and July 2010 may be showing the first signs of some slight increase in ADR. 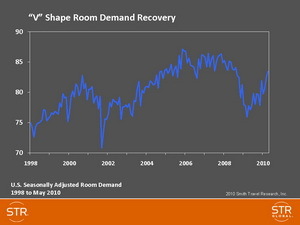 Here are the STR slides that show a “V” shaped recovery in demand, but a “U” shaped ADR recovery. 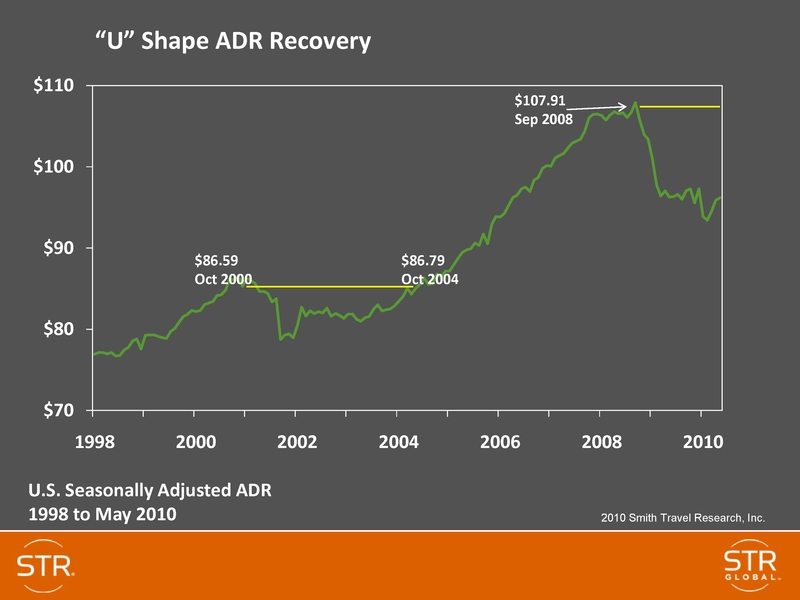 Unfortunately, the ADR recovery is essential to industry getting healthy, making profit and recovering value. And to put the ADR recovery into perspective, rates fell so far in The Great Recession, that it may take years to get back to where we were in 2005-2007 on an inflation adjusted basis. Why such a slow recovery projected? Mark Woodworth presented a slide declaring that “The Great Recession is Over . . .” and comparing it to all the recessions since World War II. If you had any doubt, this last recession has been the worst by all virtually all measures – duration, real GDP decline, industrial production decline, nonfarm employment numbers, and increased jobless rate. The real problem is that everyone thinks it is going to take a long time to create the 7.1 million jobs lost since 2008, much less catch up with new jobs needed every month just to maintain a given level of employment. 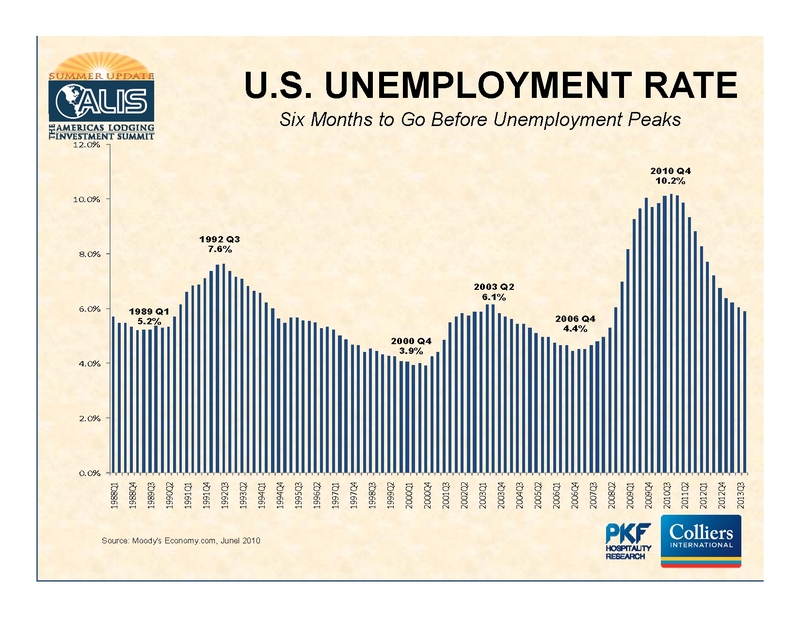 Here are two slides from Mark that project it will be the fourth quarter of 2012 before the number of jobs equals the prior level of 2008, and that even by the end of 2013, unemployment will be around 6% – way better than 10%, but still at troublesome levels. It is interesting to observe the close correlation that employment seems to have with the health of the lodging industry. Employment reflects or interacts with a lot of factors influencing how many people travel and stay at hotels. How accurate are the assumptions underlying these projections? 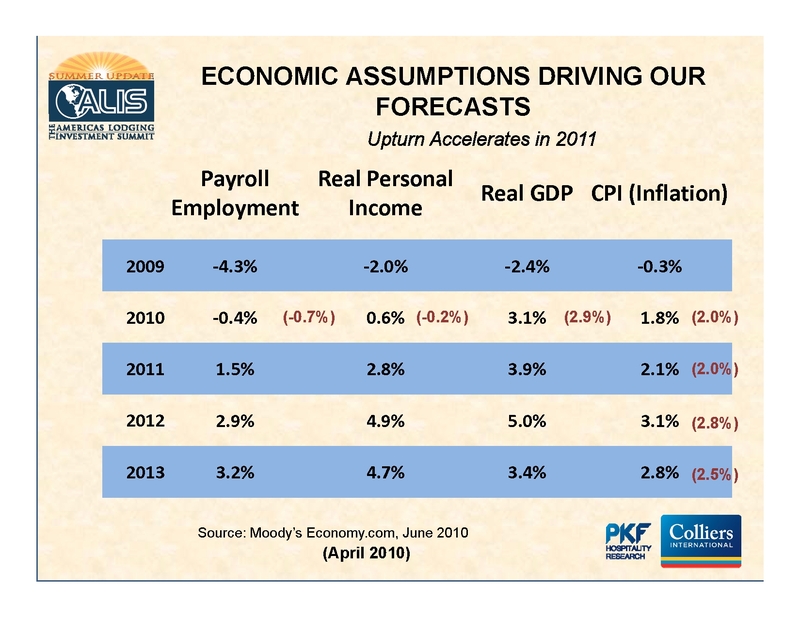 Mark Woodworth was kind enough to share his critical assumptions for the PKF forecast. Make your own assessment of whether these assumptions are too optimistic, too pessimistic or just right. The forecast? Gradually warming with clear skies or intermittent showers? PKF’s National Horizon forecast is below. While the 7.8% increase in RevPAR predicted for 2011 would be great in normal times, it does not make much headway on the 20-25% RevPAR lost by many segments of the industry in the last couple of years. 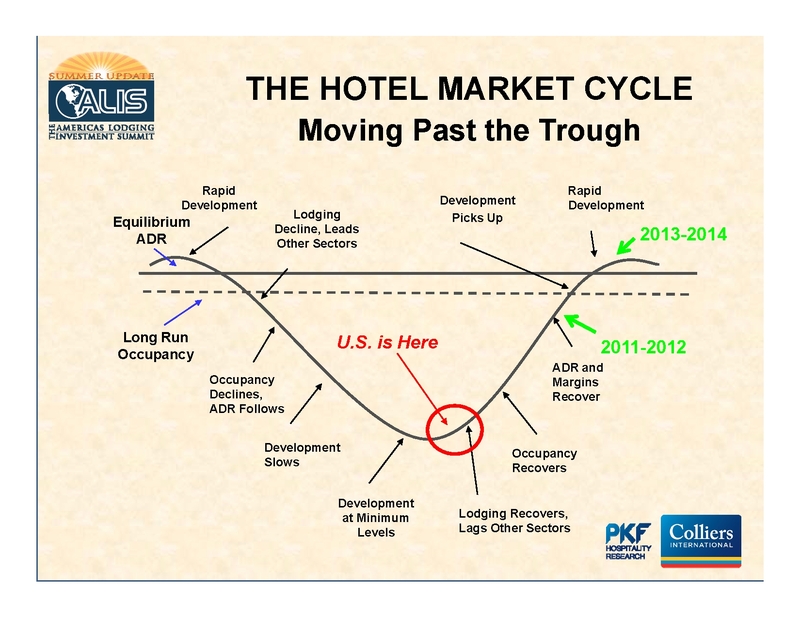 Where are we in the hotel cycle? And here is a graphic presentation of PKF’s take on where we are in the current cycle. 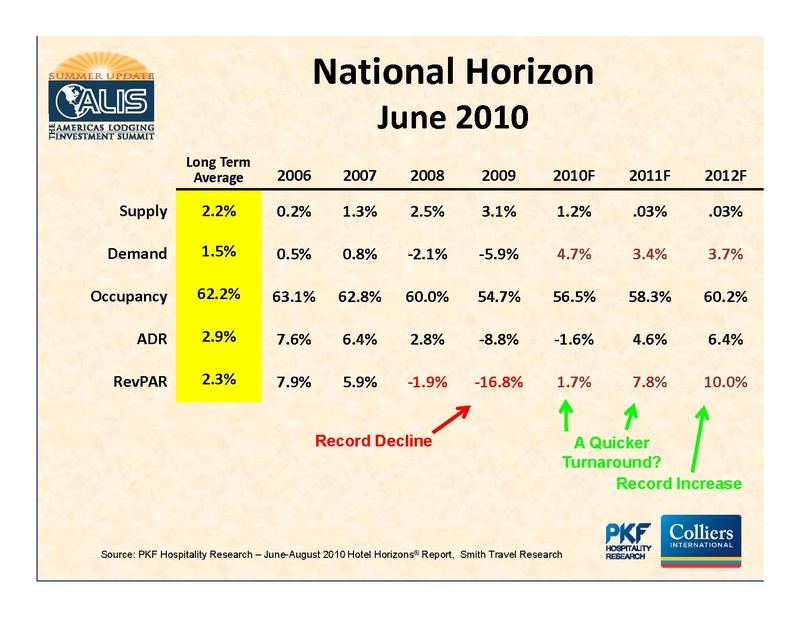 Note the horizontal lines representing long-term average occupancy and ADR rates. 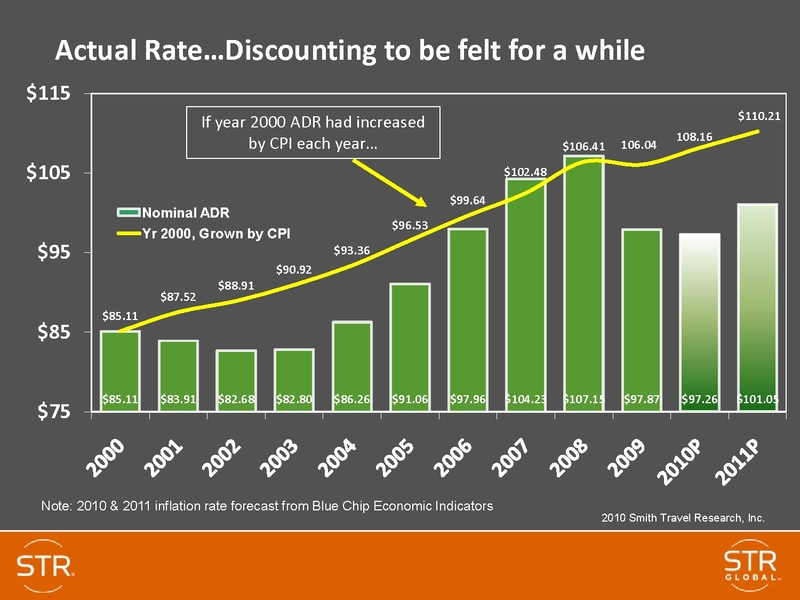 Occupancy is projected to hit long-term average in 2011-2012, but we don’t hit long-term ADR averages until 2013 and 2014. The biggest threats to recovery. OK, we all know more about how international crises, pandemics, double-dip recessions and other “significant events” might overturn the apple cart on the road to recovery. But more likely serious threats are posed by increased expenses of operations – restoring payrolls cut to the bone, paying for the new mandated health care costs, capital expenditures that will be required after years of hunkering down, energy costs, and challenges of compliance with carbon emissions, ADA standards, DOL audits, and the like. On top of this, many believe that massive increases in taxes and interest rates lie just around the next corner as we ultimately have to pay the bill for the government’s bailout and the social benefit commitments we have already incurred. It is a good thing we have some good news to balance out the challenges! In the next posting, we will share some ruminations on what this all means. If you want higher resolution copies of the slides here, just email me at the email address below. If you would like the full PKF presentation, e-mail claude.vargo@pkfc.com, and for the STR presentation, go to www.hotelnewsnow.com.